Music Honor Society Graduation Cords generally refer to the double pink honor cords used by prominent high school and collegiate honor societies, though they can also mean double gold and white graduation cords, or cords in the colors of the school that is recognizing their music graduates. Music honor societies for High School and Middle School students encourage students to participate in music-based activities that help them to grow and develop socially as well as academically. Double pink graduation cords are a great way to recognize the musical and academic achievements of a student at graduation. 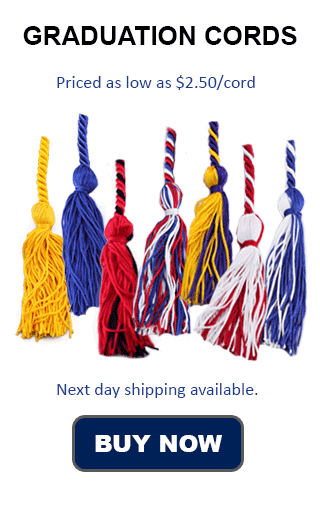 Music Honor Society graduation cords may also refer to cords of various specific collegiate honor societies, or one of the many music-related high school fraternities. As was earlier stated, Graduation Cords for a music honor society can help schools recognize the efforts and achievement of their students. Music honor societies recognize students' scholastic and musical accomplishments. Whichever Music Honor Society you belong to or advise you will be satisfied in the utmost.